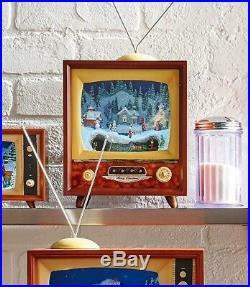 Lighted Animated & Musical Retro TV. Battery Powered Raz Imports 3516164. A little retro TV set, complete with old fashioned antenna! Tough to get good pictures tho! The scene is the village square, with a train running by on its track. The TV itself is 7.5″ wide by 6″ deep and 15 tall (with antenna). Uses 3 AAA batteries, not included. The knob on the front turns it on/off and controls the volume! Plays 8 Christmas Carols on a continuous loop: Jingle Bells, We Wish You a Merry Christmas, Silent Night, Deck the Halls, Joy to the World, The First Noel, Hark! The Herald Angels Sing, and Oh Christmas Tree. Powered by SixBit’s eCommerce Solution. 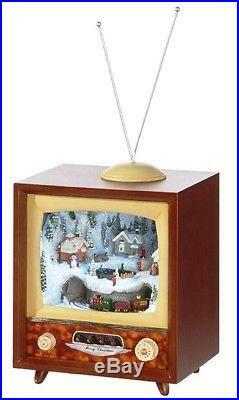 The item “Raz Imports 15 Lighted Musical TV CHRISTMAS Village & TRAIN 8 songs 3516164″ is in sale since Wednesday, August 1, 2018. This item is in the category “Home & Garden\Holiday & Seasonal Décor\Christmas & Winter\Other Christmas & Winter Décor”. The seller is “ceralinda” and is located in Magalia, California. This item can be shipped worldwide.